The clubhouse was transformed on Saturday evening into a festive venue for our New Member’s Drinks and Christmas party. Twinkling fairy lights hung from the rafters inside, a club laser served as an esky for the beer and wine on the deck, and members and their partners mingled and celebrated the end of another year. The festivities kicked off at 6pm with a toast to all of DBSC’s new members. 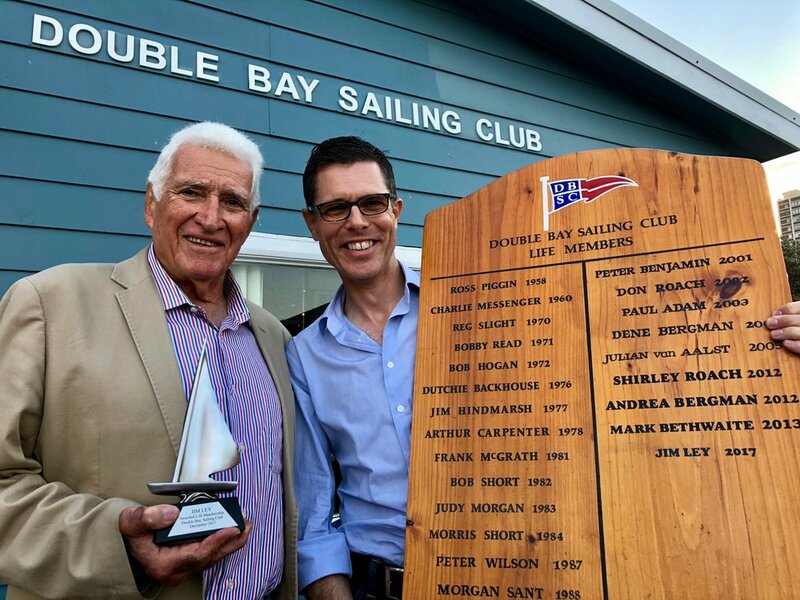 Then, Jim Ley was inducted as the newest DBSC Lifetime Member. Jim's mum, Patricia Ley, was one of the founding members of the club, and was instrumental in its formation and funding. She is memorialised by a permanent plaque on the clubhouse wall. At the time, DBSC was called the Double Bay VJ Club. Jim was the first club champion, winning in consecutive years, starting in 1956. He has been an active sailor all his life, and still competes regularly (including in World Championships) in the Finn class. Jim Ley is Inducted as DBSC Life Member. The second part of the evening was a scrumptious Christmas dinner that was enjoyed by all. The huge snappers and salmons cooked on the barbie and all the other delicious food went down a treat. Thanks to everyone who contributed so much to make the evening one to remember, particularly all those who assisted with catering! Good Times on the Deck.